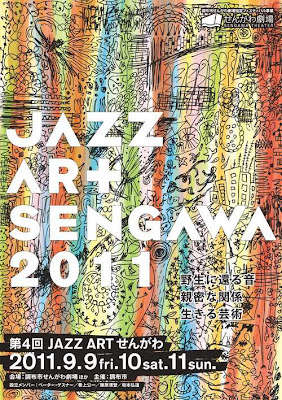 The 4th Jazz Art Sengawa, simply the best Jazz and Improvising Music event for the advanced minded in Japan, will be held on September 9-11 in Chofu, Tokyo. The producers are Makigami Koichi, Fujiwara Kiyoto and Sakamoto Hiromichi. The festival will take place at the three venues in Sengawa: Sengawa Theatre, Kick Back Cafe and Jenny's Kitchen. The line-up, which shown below, is a killer. Soejima Teruto Jazz Art Talk Session "Japanese Free Jazz and the World"
The 1-day ticket applies for all program (except "Voice Play for Children" on September 11, which required 500 yen separately - Free admission for children under 5 years old. Free Improvising Open Session and Sunday Matinee Concert are admission free.). The prices here are for advance - plus 500 yen each at door. Sep 7 update: 1 day ticket for September 11 (Sunday) is now sold out. You can still buy the ticket for each program of the day. Its price is 2,500 yen and available at the Sengawa Theatre office (open at 10:00 AM). The quantities are strictly limited (and each person can buy up to 2 tickets only), so come early. Please note: you can't see the shows if you have just the 1-day ticket only! You need both a pass (issued for each day) and a numbered ticket (issued for each program). 1. 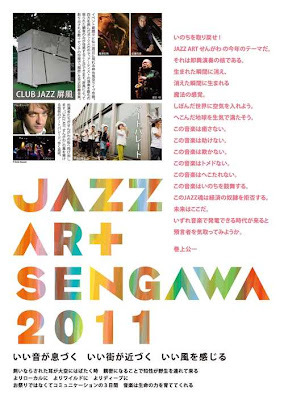 Exchange your 1-day ticket with the day's pass at the Sengawa Theatre office. Don't hurry - You should get the pass if you have the day's ticket. 2. Get a numbered ticket for the program you'd like to see, at the venue of the program. If you want a good seat, be in a hurry - it's "first come, first served" basis. 3. Wait in a line at the venue. When your turn comes, show your pass and numbered ticket at the entrance. That's the theme for the festival this year. It's a sense of magic. Pump up the shrinked world. Fill up the earth with the vitality. The music is not to heal. The music is not to help. The music is not to deceive. The music is not to be over. The music is not to de defeated. The music is to stir up the soul. The soul of jazz refuses to be an economic slave. There comes a time generating electricity with music. I just found that les Rois Tourbillonnants, a French electro unit, did a cover of Puyo Puyo. Surprisingly, they sang it in Japanese. A nice effort.